At all our our offices, we offer high quality full and partial dentures. We want our patients to have the best denture possible and we have a wide selection of dentures and partials for every patient’s budget. Each denture and partial has its own distinct advantages. Full dentures replace all the teeth in one dental arch. Partial dentures replace one or several teeth in a dental arch. Pricing for full and partial dentures start at $650 per arch. The Premier Denture or Partial has a very high natural appearance and is portrait quality. This denture is made using premium quality denture teeth with an enhanced appearance. These teeth offer more natural chewing surfaces and are resistant to stain when cleaned properly. The Premier Denture offers more shade selections than the Superior Denture or Partial. The Premier Denture teeth are set in a wax base so you can view and approve the denture look before the denture is processed in acrylic. Any changes to the denture can be made at the time of the wax try in. After you have approved the look and appearance of your new Premier Denture or Partial, the dental laboratory will complete the process of your denture to ensure the best fit possible. Premier Partials or Dentures are $950 per arch. Full set of Premier Dentures are $1,850. The Superior Denture or Partial is made with high quality teeth and is available in 12 tooth shade selections for a more natural looking appearance. The Superior Denture teeth are set in a wax base so you can view and approve the denture look before the denture is processed in acrylic. While the denture is in wax, you may make changes to the teeth until you are happy with the look and appearance of your new denture or partial. Once the wax try in of your new Superior Denture or Partial is approved, the dental laboratory will complete the process of your denture to ensure the best fit possible. Superior Partials or Dentures are $650 per arch. Full set Superior Dentures are $1,250. At all of our offices, we offer every type of partial available to patients including acrylic, flexible, clear, and cast metal partials. Our partial dentures start at $650 per arch. The cast metal partial denture is the strongest partial. This partial has a metal framework base with teeth attached to it. These partials can be thinner than acrylic partials because the metal base is stronger than acrylic base. Cast metal partials attach to natural teeth using metal clamps. Cast metal partial dentures are less bulky than acrylic partials and offer a great fit. Cast Metal Partials are $1,175 per arch. The flexible partial denture is a strong partial made on a flexible base. These partials can be thinner than acrylic partials because they are stronger. Flexible partial dentures do not contain any metal and have a very natural appearance. 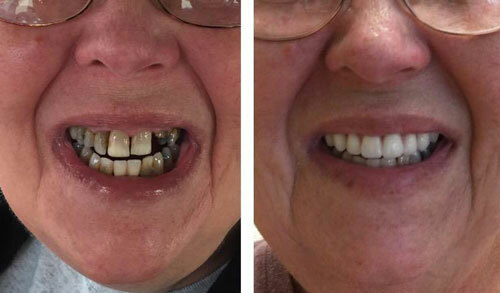 Flexible partial dentures attach to natural teeth by flexible clasps. Flexible Partials are $1,175 per arch. The clear partial denture is made on a clear framework. These partials can be thinner than acrylic partials because they are stronger. Clear partial dentures do not contain any metal and have a very high natural appearance. Clear partial dentures attach to natural teeth by clear clasps. Clear Partial Dentures are $1,175 per arch. Acrylic partial dentures are the most affordable partial denture. This partial has a pink acrylic base with teeth attached. Acrylic partials attach to natural teeth with small metal clasps. Acrylic Partial Dentures start at $650 per arch. Our offices provide immediate dentures to patients who need extractions and want dentures placed immediately after extractions. For these patients, we offer the popular FIRST TIME DENTURE WEARER SAVINGS BUNDLE. This savings bundle includes an immediate denture, up to three soft relines to add comfort to the denture during healing, and a final denture to be provided when healing of the tissue and bone is completed (this process usually takes between 8 to 12 months depending on many factors). Please call any of our offices for more details!